Sukhothai (Thai: สุโขทัย) is one of the lower northern provinces (changwat) of Thailand. Neighboring provinces are Phrae, Uttaradit, Phitsanulok, Kamphaeng Phet, Tak, and Lampang. Sukhothai can be translated as Dawn of Happiness. The modern-day province of Sukhothai was named after the Sukhothai Kingdom that once existed in the area, which in turn borrowed its name from the Sanskrit terms sukha (सुख "happiness") + udaya (उदय "rise, emergence"), meaning "dawn of happiness". Sukhothai is located in the valley of the Yom River in the lower north of Thailand. The provincial capital, Sukhothai Thani is 427 kilometres (265 mi) north of Bangkok and 300 kilometres (190 mi) south of Chiang Mai. The province covers some 6,596 square kilometres (2,547 sq mi). The Khao Luang Mountain Range, with its four main peaks: Khao Phu Kha, Khao Phra Mae Ya, Khao Chedi, and Pha Narai, lies within the Ramkhamhaeng National Park in the south of the province. The Si Satchanalai National Park is located in the north-west, protecting the mountainous forest areas of the Phi Pan Nam Range at the northern end of the province. Sukhothai, meaning the Dawn of Happiness, was a town founded in the 13th century on the fringe of the Khmer empire. The exact year is unknown, but according to the Fine Arts Office it was between 1238 and 1257. Founded by Phokhun Si Intharathit, it was the first truly independent Thai (Siamese) Kingdom after defeating the Khmers. Sukhothai enjoyed a golden age under their third king, King Ramkhamhaeng, who was credited with creating the Khmer-derived Thai alphabet which is essentially the same as that in use today. He also laid the foundation for politics, the monarchy and religion, as well as expanding its boundary of influence. Sukhothai was later ruled by many kings. The province is most famous for the historic city of Sukhothai, the capital of the Sukhothai kingdom. It is located about 12 km from the modern New Sukhothai city. 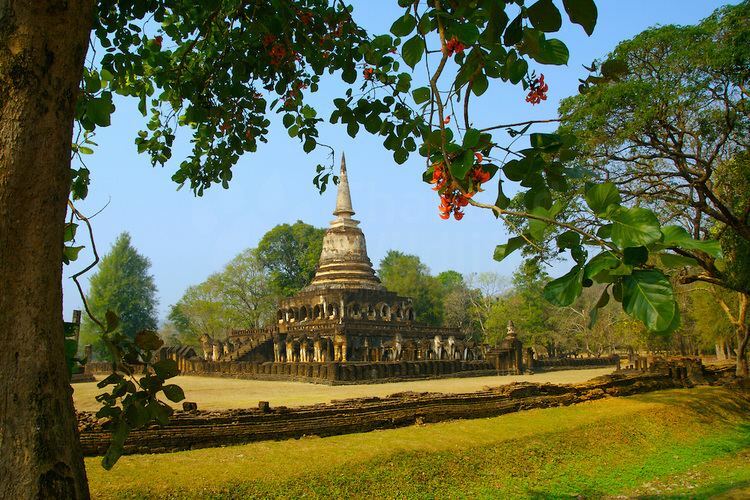 Not far from Sukhothai are the Si Satchanalai historical park and the Kamphaeng Phet Historical Park. Both were cities within the former Sukhothai kingdom and of the same time period. The inhabitants of Sukhothai still speak the Sukhothai Dialect of Thai among themselves. A language which has been spoken since the formation of the Sukhothai Kingdom, some 700 years ago. The Sukhothai Dialect is distinct from Central Thai in both tone and vocabulary and is thought to be similar to Proto-Tai in tone structure, an ancestor to the modern Thai language. However, the inhabitants of Si Satchanalai and Thung Saliam District located in the northern part of the province, mainly speak Kham Muang (also known as Northern Thai or Lanna). Nevertheless, Central Thai is understood by nearly everyone as it is used for both education and to do business. The provincial seal shows King Ram Khamhaeng the Great sitting on the Managkhasila Asana throne. Under King Ramkhamhaeng the kingdom of Sukhothai flourished the most. Provincial tree is Afzelia xylocarpa; provincial flower is the Lotus (Nymphaea lotus). The provincial slogan is Source of national heritage and pride, birth place of the Thai alphabet, fireworks of the Loy Krathong festival, preservation of Buddhism, the fine Teen Jok cloth, ancient golden chinaware, holy image of Ramkhamhaeng the Great's mother, the dawn of happiness. The province is subdivided into nine districts (amphoe). These are further subdivided into 86 communes (tambon) and 782 villages (muban). Sukhothai Airport is located in the Sawankhalok District and is about 30 kilometres (19 mi) away from downtown. Flights operate daily between Sukhothai and Bangkok. Songthaews are the most popular form of public transport in the new city and the rural areas. Larger sized Songthaews travel to and from the old and new cities. Air-conditioned buses run regularly from Sukhothai Bus Terminal to Bangkok and Chiang Mai, stopping off at other major towns on the way. Non air-conditioned buses are for inter-provincial travel to the other districts. Sukhothai province is most famous for its historical city of Sukhothai, the first capital of Siam, founded by King Ramkhamhaeng. The province’s temples and monuments have been restored well and Sukhothai Historical Park – a place with numerous sites of historical interest – has been made into a UNESCO World Heritage Site. Other interesting places include Ramkhamhaeng National Museum, Ramkhamhaeng National Park, Sri Satchanalai National Park, and The Royal Palace and Wat Mahathat. Sukhothai Historical Park is located in Tambon Muang Kao, Ampher Muang Sukhothai. It is 12 kilometres (7.5 mi) away from town. It is opened daily from 8.30 a.m.-4.30 p.m. Ruins of the royal palaces, Buddhist temples, the city gates, walls, moats, dams, ditches, ponds, canals, and the water dyke control system, which were the magical and spiritual centre of the kingdom, are now preserved and have been restored by the Fine Arts Department with the cooperation of UNESCO. It’s not only with a view of fostering Thailand's national identity, but of safeguarding, a fine example of mankind's cultural heritage. Wat Mahathat is the largest temple with a customary main Chedi in lotus-bud shape and an eight metre high Buddha image. It is located in the middle of town that reflects to prosperity of the Sukhothai architecture within the monastery are housed Phra Rattana Chedi, the pagoda of the temple, which was erected on the Charot Withithong Rd. The museum collection includes gifts from the ex-abbot of Wat Ratchathani and art objects unearthed in Sukhothai and nearby provinces, so if everyone is interested in art objects, Monument of Phor Khun Ramkamhaeng museum is a good place to visit. 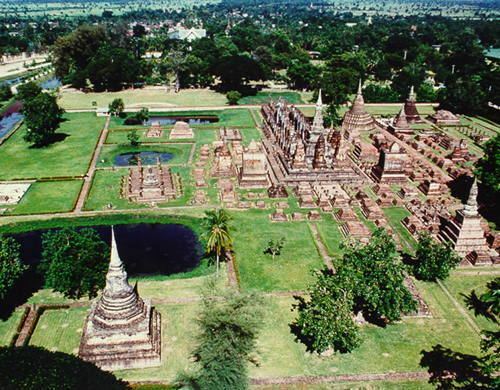 Si Satchanalai historical park is registered by the UNESCO as the world’s heritage like Sukhothai historical park. It is situated at Kaeng Luang in Tambon Sri Sachanalai, Amphur Sri Sachanalai, about 52 kilometres (32 mi) away from town centre. It was formerly called "Muang Chaliang;" the name changed to "Si Satchanalai" during the reign of Phra Ruang when a new administrative centre was established to replace Chaliang. Ruins of 134 monuments have been discovered within the park. Ramkhamhaeng National Park is widely known as Pa Kho Luang. It covers an area of about 341 square kilometres (132 sq mi), or 213,125 rai. It is blessed with wildlife, birds, and natural beauties, including fertile tropical jungles and mountain. Ramkhamhaeng National Park, within the province of Sukhothai, is surrounded by the districts of Kirimas, Ban Dan Lan Hoi, and the provincial capital of Sukhothai. Khao Luang is an important source of water for its surrounding areas. This exquisite national park, with a combined natural and historical background, covers an area of 341 square kilometres (132 sq mi), and was declared to be a national park on October 27, 1980. High hills and steep cliffs, some over 1,200 metres above sea level, together with fascinating falls and different species of plants and wildlife, are some of the major attractions available in this park offered to nature-loving tourists or visitors. Furthermore, the archaeological and historical sites with ancient remains and relics make the park even more attractive, especially for critics and theologians. The park also contains a lot of natural beauties, such as the Khao Luang mountain range, Sai Rung Waterfall, an herbal garden, and the Savannah located in the high country of the Khao Luang range. High country of the Khao Luang mountain range: The four main peaks of the park are within the high country. These peaks offer beautiful views. Khao Phu Ka and Khao Phra Mae Ya at 1,200 meters above sea level are the park's highest summits. Looking up from the park's headquarters, one can see the outline of a woman, in what some people would say is a very suggestive position, on one of the ridgelines. Si Sachanalai National Park was proclaimed a national park on 8 May 1981. With a total area of 213 square kilometres (82 sq mi) in Amphoe Si Satchanalai and Amphoe Thung Saliam of Sukhothai Province, Si Satchanalai National Park offers trekking routes through waterfalls and caves. There is Tad Dao Waterfall, originated from the Tha Pae stream. The 30-meter-high fall is wonderful, ideal for rest and relaxation. Thara Wasan Cave, blessed with fantastic stalactites and stalagmites, is located about 1.5 kilometres (0.93 mi) away from the park's office. Wildlife is found here, including hundreds of thousands of bats. 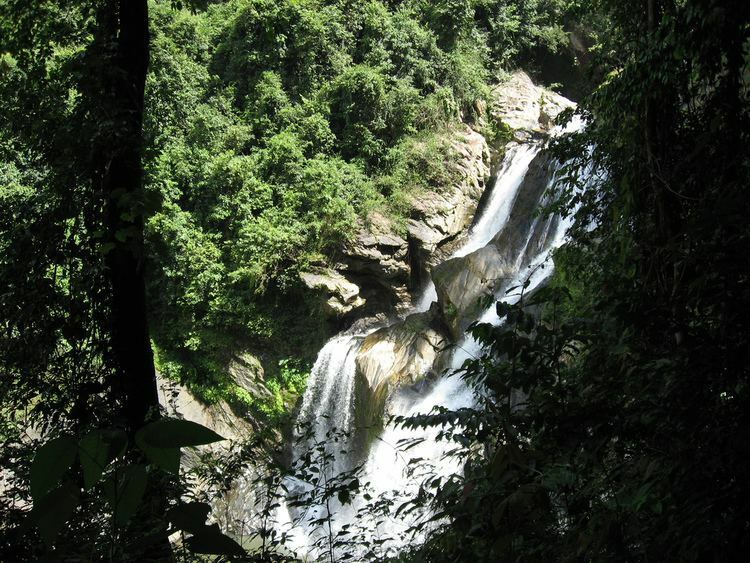 Tad Duan Waterfall, situated about 500 meters away from the office of the park, is ideal for swimming. Conveniently accessible. Everyone can enjoy. Phra Mae Ya Shrine (ศาลพระแม่ย่า) is situated in front of the City Hall, Thanon Nikhon Kasem, by the Yom River. The shrine is highly respected by Sukhothai residents. It houses an idol of Phra Mae Ya, a stone figure with a long face, tapered chin, long halo and dressed as an ancient queen. The idol is supposed to have been built during King Ramkhamhaeng the Great’s reign as a dedication to his late mother Nang Sueang. In this connection, the word Phra Mae Ya or grandmother in Thai is literally a term of endearment since the local people regarded King Ramkhamhaeng the Great as their father. The statue was formerly housed in a rock shelter of Phra Mae Ya Mountain. The Sukhothai residents later relocated it to the present shrine situated in front of the City Hall. The shrine is also believed to house the spirit of King Ramkhamhaeng the Great. The Phra Mae Ya Fair is held annually in late February. Sangkhalok Museum (พิพิธภัณฑ์สังคโลกสุโขทัย) is located within Mueang Ake Plaza, Thanon By-pass, just 12 kilometres (7.5 mi) off the old city. The museum displays more than 2,000 pieces of Sangkhalok ceramic wares collected from various sources both locally and internationally. The Fish Museum (พิพิธภัณฑ์ปลาในวรรณคดีเฉลิมพระเกียรติ) is located in the Rama IX Park, along Highway 12. 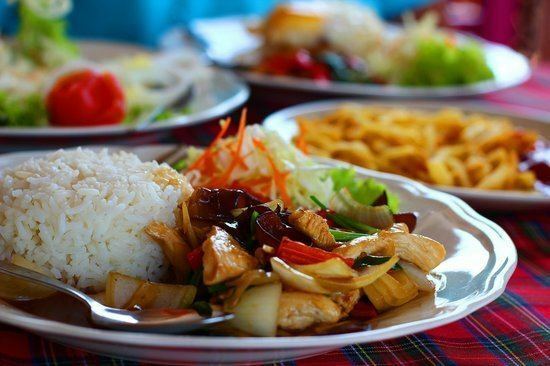 It displays a variety of fresh water fish mentioned in Thai literature, such as the travel poems titled Kap Ho Khlong Nirat Phra Bat and Kap Ho Khlong Praphat Than Thongdaeng, and the Kap He Ruea boat song by Chaofa Thammathibet (Chaofa Kung). The Ramkhamhaeng National Museum (พิพิธภัณฑสถานแห่งชาติรามคำแหง) houses many artifacts found from archaeological excavations in Sukhothai, as well as those donated by the locals. The museum is divided into three premises: the Lai Sue Thai Chet Roi Pi Memorial Building, Museum Building, and Outdoor Museum. The Sawankhaworanayok National Museum (พิพิธภัณฑสถานแห่งชาติสวรรควรนายก) houses exhibits in a two-storey building. Upstairs houses sculptural collections from various periods, mostly those formerly collected within the compound of Wat Sawankharam and offered by Phra Sawankhaworanayok. In addition, there are Buddha images, relocated from the Ramkhamhaeng National Museum, from the pre-Sukhothai to the early Ayutthaya period. The Centre for Study and Preservation of Sangkhalok Kilns (ศูนย์ศึกษาและอนุรักษ์เตาสังคโลก (เตาทุเรียง)) is considered the industrial area of Si Satchanalai. Numerous celadon wares in broken, as well as perfect, condition have been discovered. The kiln is oval in shape with a curved roof like that of a ferryboat and is 7–8 metres long. The centre consists of two buildings situated on the kiln site area with two kilns Nos. 42 (ground level) and 61 (underground) exhibited in situ. There are also exhibitions on artifacts, academic documents, and on the evolution of ancient ceramic wares. Some visitors enjoy cycling around the orchards and tasting a variety of fruits like pomelo, santol, sapodilla, coconut, star fruit, various kinds of bananas, as well as the tasty and fleshy plum mango (Bouae Macrophylla) with its chicken-egged size. Tambon Ban Tuek Community of Amphoe Si Satchanalai. This is a small and peaceful community filled with trees, paddy fields, and scenic mountain ranges, while tourists can enjoy the traditional life of fruit growers. Different types of fruits grown along the hilly terrain include longkong, langsat, mangosteen, durian, banana, pomelo, rambeh, and rambutan. Cycling Route: The Old Town of Sukhothai Trips within the Sukhothai Historical Park are also made by personal or rental bikes. Khanom Kliao (ขนมเกลียว) Famous snacks of Sukhothai made from wheat flour and egg, seasoned with salt and pepper, and made it into a twist shaped-dough. Fried until crispy and further glacé. It has a sweet taste and is available everywhere. Sangkhalok ceramics (เครื่องสังคโลก) These replicas arguably look as good as the originals. Thung Luang terra cotta (เครื่องปั้นดินเผา) of Khiri Mat district come in unique patterns. The products include flower pots, vases, basin, water jar, lamps, with perforated decorations of animal fiqures like frogs, bullfrogs, and dogs. Butter-baked Banana (กล้วยอบเนย) A well-known snack of Amphoe Khiri Mat, it resembles another local sweet called Khanom Rang Nok made from sweet potato. This butter-baked banana snack is made from slicing raw banana horizontally, left to dry for half a day, seasoned with salt, deep fried, adding sugar, and giving it a good stir. Sprinkle with sesame seeds and add butter. This product is available everywhere. Local Snacks: Khanom Phing, Thong Muan, Thong Phap, Thong Tan(ขนมผิง ทองม้วน ทองพับ และทองตัน) Famous crispy snacks of various shapes: square, round tube, and thick roll. Fried peanuts (ถั่วทอด) of Si Samrong district, also called “200-year fried peanuts”, are a tribute to a technique which has been inherited for many generations. The recipe is a mixture of rice flour, wheat flour, eggs, coconut milk, salt, pepper, chopped wild yam, which are then deep fried. Ancient gold reproductions (ทองโบราณ) of Si Satchanalai district are entirely hand-made by skilled workers. These replicas of the Sukhothai style products include necklaces, wristlets, bangles, earrings, rings, etc. Ancient silver reproductions (เงินโบราณ) These replicas are entirely hand-made with distinctive skill. They are available at all silver shops in Amphoe Si Satchanalai. Hat Siao fabric (ผ้าหาดเสี้ยว) comes with nine beautiful patterns woven with the use of a supplementary weft technique, done by the descendants of Thai Phuan, who migrated from the north of Vientiane in Laos. Marble Products (ผลิตภัณฑ์หินอ่อน) The marble products from Amphoe Thung Saliam - Thoen include tables, chairs, flower pots and alarm clocks. The Thais are a friendly, laid-back, non-aggressive, and non-confrontational people who are known worldwide for their impressive smiles – even to complete strangers. The Thai-Chinese make up the majority of Sukhothai’s new town urban folk while the original Thai-Thais prefer their more traditional rural roots in the Sukhothai countryside. The northern Thais in Sukhothai are Lanna in origin and their ancient roots lie in Burma, Tibet and southern China. The people of Sukhothai are very proud of their heritage and do not take easily to tourists there who don’t show any interest in wishing to learn about their history. Since they look up to King Ramkhamhaeng the Great as their adopted father, all foreign tourists should only mention him with respect. Phor Khun Ramkhamhaeng’s Day Festival (or King Ramkhamhaeng the Great Memorial Fair (งานวันพ่อขุนรามคำแหงมหาราช) Phor Khun Ramkhamhaeng’s Day Festival, annually held on January 17. It honors of the Great King of Sukhothai Kingdom. In this day, people will visit the Monument of Phor Khun Ramkamhaeng the Great for praising Phor Khun Ramkhamhaeng. People will make merit and present food to a Buddhist priest. At night, there is merrymaking and many shows that all people can enjoy. There are fireworks, too. Song Nam Aui Than Festival Song Nam Aui Than Festival is annually held on April 12, Songkran Ceremony in the SriSathanalai Historical Park. It exhibits the Buddha image procession from Wat Phra Prang to the Historical Park for people who want to pour the water over the Buddha image. Si Sachanalai Ordination Celebration Si Sachanalai Ordination Celebration is called by Thais as "Buat Chang Hat Siao", held annually during 7–8 April at Ban Hat Sieo, Ampher Si Sachanalai. It features a spectacular procession of ordination candidates in colourful costumes on the backs of some 20-30 decorated elephants. Sukhothai Loi Krathong and Candle Festival The tradition which was founded in Sukhothai on the banks of the Yom River several hundred years ago derived from traditional Tai beliefs common to communities living along the banks of a river or waterway. It has become a need to worship and supplicate the Khongkla to avoid bad luck, to worship the gods in the Brahmin tradition, or to revere the Buddha's footprint. The celebrations are normally organized in the 12th month when the tide is high and the air is cool. Sukhothai’s Loi Krathong is held annually on the full moon night of the 12th lunar month at the Sukhothai Historical Park. The Krathongs, or floats, have been made in the form of lotus. There is also a reference, in the Sila Charuek, to candle lighting and playing with firework in a grand festival believed to be similar to the candle lighting and firework as practiced in the current Loi Krathongs Festival. In this festival, there are Nang Nopphamat procession, exhibitions, lighting of lantern at the historical site, Loi Krathong, fireworks over all waterways, and a Krathong competition. Phra Mae Ya Homage Paying Fair and Sukhothai Red Cross Fair (งานสักการะพระแม่ย่าและงานกาชาดจังหวัดสุโขทัย) This is held at the beginning of February every year around the Sukhothai City Hall, Nirakasem Road, Tambon Thani. A procession paying homage to Phra Mae Ya, a local sports competition, an exhibition, a local handicraft demonstration and entertainment, are held. Si Satchanalai Elephant Back Ordination Procession (ประเพณีบวชพระแห่นาคด้วยช้างของชาวหาดเสี้ยว) A traditional ceremony of the Thai Phuan, citizens of Ban Hat Siao, Si Satchanalai Elephant Back Ordination Procession or Buat Chang is held annually during 7–8 April at Ban Hat Siao, Amphoe Si Satchanalai. The 7th is the crux of the event, when a procession takes place. On the 8th features a spectacular procession of ordination candidates in colourful costumes on the backs of some 20-30 decorated elephants. The ordination ceremony includes head shaving, bathing, and dressing up candidates, as well as, elephants. The procession is held around the village and the Si Satchanalai District Office. Songkran and Mueang Sawankhalok Festival (งานประเพณีสงกรานต์และเทศกาลเมืองสวรรคโลก ) This takes place during 11–15 April annually on the bank of the Yom River, in front of Wat Sawang Arom, by the Yom River, and at the Stadium of the Sawankhalok Municipal School. The procession of Miss Songkran, the Sawankhalok Food Festival, ceremonies of giving alms to monks and bathing rituals for Buddha images and monks are performed in the festival. Songkran Festival (งานประเพณีสรงน้ำโอยทาน สงกรานต์ศรีสัชนาลัย) An annual celebration of the Thai New Year is held during 12–13 April at Si Satchanalai Historical Park, Amphoe Si Satchanalai; this festival carries forward Sukhothai’s tradition. It was mentioned in the famous stone inscription “The Sukhothai people are generous, abide by precepts, and always give charity”, which is believed to be inscribed during the reign of King Ramkhamhaeng the Great of the Sukhothai Kingdom. The highlights of the event include the elephant procession, offering rituals to pay respect to Phra Suea Mueang, the tutelary spirit and kings from the Phra Ruang Dynasty, Miss Songkran beauty queen contest, local sport competitions, and cultural performances. Hae Nam Khuen Hong Festival (งานประเพณีแห่น้ำขึ้นโฮง) This is organized annually during 18 – 19 April at the plaza of Chaopho Mueang Dong Monument, Tambon Ban Tuek, Amphoe Si Satchanalai. The ceremony is held to honour “Muen Nakhon” or “Chaopho Mueang Dong”, the establisher of Dong City. He was talented and courageous, as well as specialized in catching elephants and utilising them in war. Later, he was executed to prove his loyalty to King Tilokkarat. Then, the villagers organized a ceremony to pay homage to Chaopho Mueang Dong by preparing a more-than-50-elephant parade wonderfully decorated, passing the village to pay respect to the shrine of Chaopho Khao Mung and onward to the plaza of Chaopho Mueang Dong Monument to pay homage to Chaopho Mueang Dong. Khao Luang Winning Day (งานวันพิชิตยอดเขาหลวง) This is a yearly event that Sukhothai province has organized for tourists and the local people to climb up to the summit of Khao Luang in the Ramkhamhaeng National Park, Amphoe Khiri Mat. The event is held around November every year. Sukhothai has its very own specialty noodle dish simply called Sukhothai Noodles. They are a blend of Thai rice noodles (khanom chin) mixed with crispy pork, garlic, green beans, coriander, chili, and peanuts in a broth flavored with dark soy sauce. Sukhothai Town has one main government hospital, which is Sukhothai Hospital. 22 kilometers away is another large government hospital called Srisangworn Sukhothai Hospital, located in the Si Samrong District. Ruam Phaet Sukhothai Hospital is the only private hospital in the province and is located across from Sukhothai Hospital. Local television and satellite TV channels are available. English language newspapers and magazines are available in some bookstores. Landline telephone, satellite phone, and all mobile phone systems are available at Sukhothai downtown and village areas. Internet can be accessed in hotels, resorts, and internet cafés. 4G and 3G mobile internet connection is available throughout most of the province. There are post offices in every district.